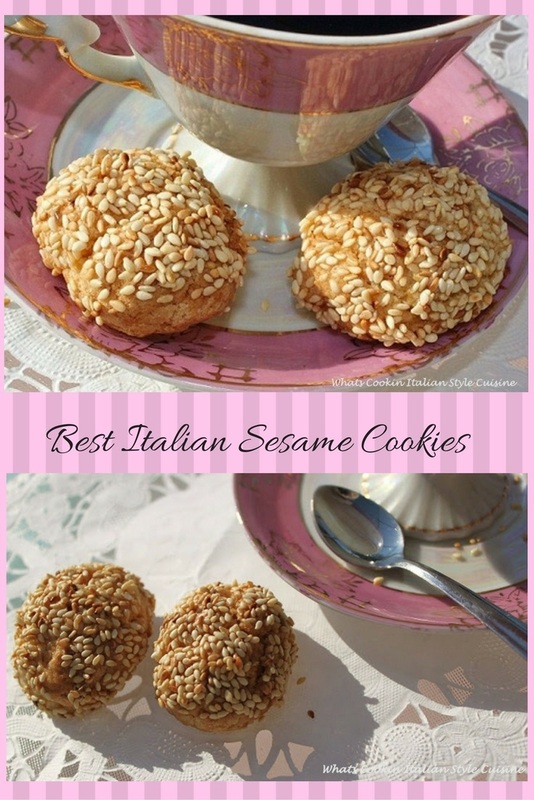 These are the BEST Italian Sesame Cookies I have ever had. Once you try them you'll see why! These were always in the cookie jar when I was a child. I am not sure who loved them more my father or my brothers. At the time I wasn't a huge fan. Being a child I liked the typical sweet cookies like chocolate chips and other chocolaty delights. As I grew up I really learned to appreciate Italian cookies and now miss my mom's and grandmother's baking. Anisette, lemon cookies, biscotti of any kind and these now are an all time favorite in my house. I have to make them every time my brother John comes to visit, he would be so disappointed without bringing a batch home. They are his ultimate favorite cookie. I recommend toasting them to get an even nuttier flavor out of the sesame seeds. I explain how easy it is to toast them. You can buy them toasted but will pay twice the price. These are often found on Christmas and wedding trays. You can flavor them any way you prefer. We like lemon or anisette. 1 teaspoon vanilla, almond , lemon extracts, anise, orange..... any one will do well. 1- 1/2 cups of toasted sesame seeds . Mix everything in a large bowl except the egg whites. Beat those and set aside. Roll into egg shaped logs, dip in the egg whites, roll into the sesame seeds. Place on a greased cookies sheet. Bake at 375 preheated oven for 15 to 20 minutes until golden brown. When toasting, use a wide frying pan. on medium heat, shaking the pan occasionally. Remove the seeds when they darken and become fragrant. For oven toasting, preheat the oven to 325 degrees Fahrenheit. Bake until the seeds brown and become fragrant. For both methods, allow the toasted seeds to cool. Store in a covered jar at room temperature. about 15 minutes using the oven. Oh my gosh I love these!!! Nobody in the family makes them now. I'm gonna beg my cousin Anna, the baker, to make these. In fact, I'll email her your post! This cookie sounds really wonderful, and unique. I have never had one before, but will definitely have to try one soon! Ahhhh, Italian food makes me smile. :) These are just the cookies that I look forward to when I go to visit my friends who happen to be Italian...their nonna makes the best sesame seed cookies! I should give them a call soon...I need to feast on some yummy Italian food. Oh, I've never had this cookie...but it looks fabulous...and I know it would be lovely with a cup of tea. Thanks, Claudia!!! Love the sesame....it would be wonderful in a cookie. These look great and easy to make Claudia! Thanks for posting this. I'll certainly try them out soon! Thanks for visiting my blog and for your encouragement. I'm so glad you liked the Caponata recipe and that it was your dad's favourite! It is MY favourite as well! I love italian food in general! I'm a once-a-year baker, but these were easy to make and came out great. Grazie!